I’m starting to wonder how many more times I’ll begin a blog post with an apology for how much time has elapsed since the previous post. I think 2 to 3 more times, which is not too bad. This means that I can see the light at the end of the grad school tunnel. I only have 5 more weeks until I’m completely finished with my coursework! All I’ll have left are my 2 semesters of student teaching/externship. Yay! Even though I haven’t had a tremendous amount of time to cook lately, there is one recipe that I’ve been making pretty often these days and I thought I would share it with you today. 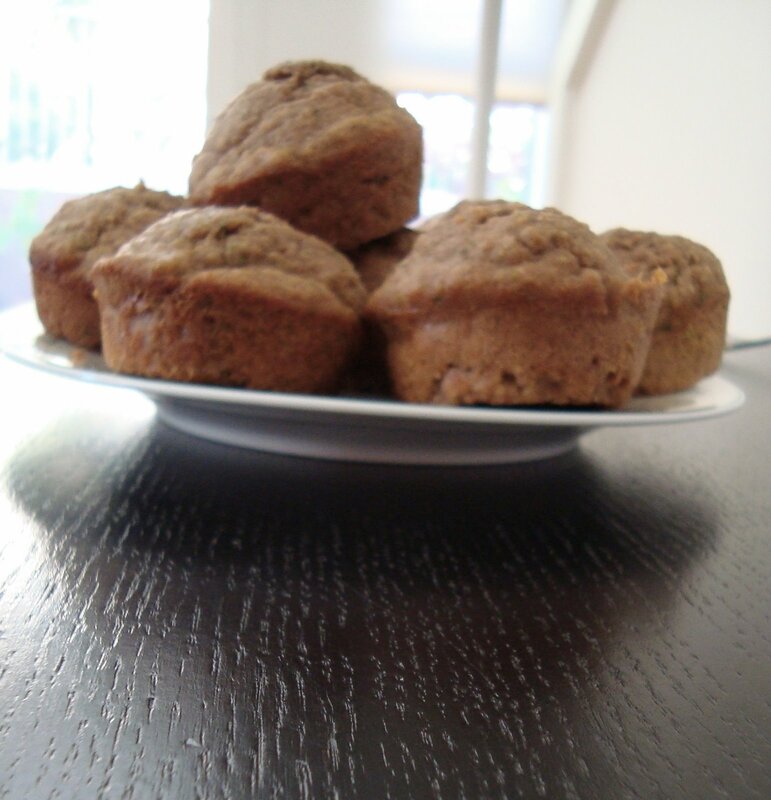 It’s a recipe I created myself for Banana Oat Bran Muffins. 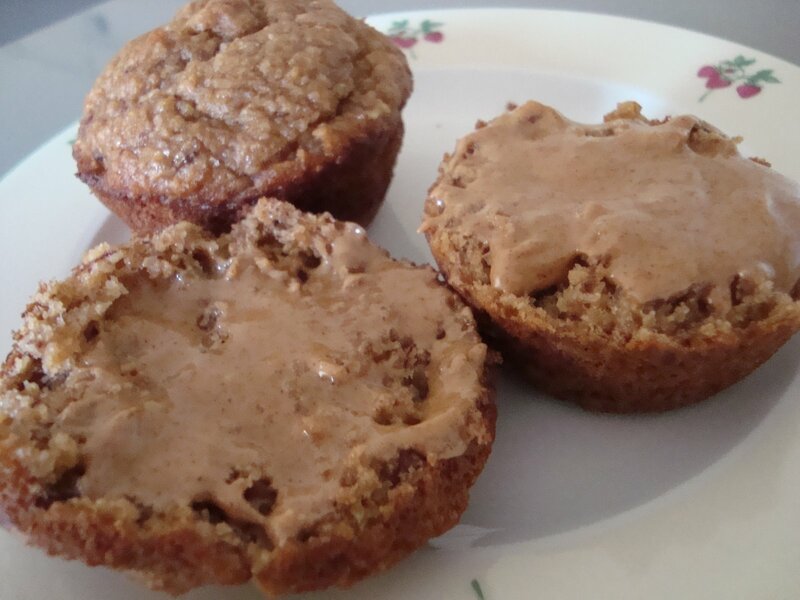 These came about because I love banana bread, but wanted to make the recipe a tad bit healthier. I ended up re-vamping my original banana bread recipe completely and came up with something quite tasty. They break from my usual attempts at eating only local produce, since bananas are basically never local in the US. But, in the fall and winter, when we don’t have the plethora of summer fruits, I am okay buying bananas now and again. Oh, and I posted the recipe for these on sparkpeople.com and so far have received 8 ratings on it! The average rating is 4.9 out of 5, so apparently other people think they’re good too. According to the sparkpeople.com calorie calculator, these are 130 calories, 1 gram of fat, 30 grams of carbs, 3 grams of dietary fiber, and 3 grams of protein. Preheat oven to 350 degrees. Mash the bananas thoroughly and combine with the egg. Stir in apple sauce, followed by the sugar, (EDIT: Also add vanilla extract here), crushed Kashi Autumn Wheat, and Oat Bran. Mix together the flour, salt and baking soda, and add these dry ingredients to banana mixture. Divide into muffin tin and bake for 30 minutes. You may find the use of crushed Kashi Autumn Wheat strange, but it actually works quite well. I initially decided to include this because we regularly have Kashi Autumn Wheat for breakfast and I didn’t like throwing away the crumbs from the bottom of the bag. If you don’t have this cereal on hand, you could use any brand of shredded wheat instead. Since 12 muffins is a lot for 2 people to consume in a short period of time, I usually throw half of them in a freezer bag and keep them frozen. When I want a muffin I microwave one for 30 seconds and then toast it for a few minutes. They’re great for breakfast with a bit of almond butter! This entry was posted in baking, breakfast, easy cooking, vegetarian on November 11, 2008 by seedsowingmama.